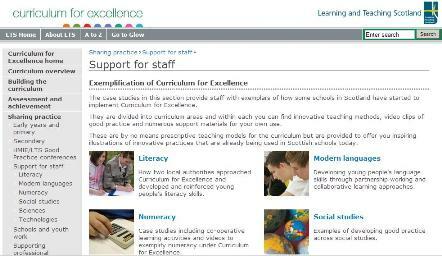 The case studies in this section provide staff with exemplars of how some schools in Scotland have started to implement Curriculum for Excellence. They are divided into curriculum areas and within each you can find innovative teaching methods, video clips of good practice and numerous support materials for your own use. These are by no means prescriptive teaching models for the curriculum but are provided to offer you inspiring illustrations of innovative practices that are already being used in Scottish schools today.